Agents Of SHIELD Season 5: Is Coulson’s Ghost Rider Deal Tied To Earth’s Fate? What is Agent Coulson’s deal with Ghost Rider? That was the Agents of SHIELD Season 4 cliffhanger and now that secret appears to be related to the destruction of Earth in Agents of SHIELD Season 5. The synopsis for Agents of SHIELD Season 5 episode 12, the 100th episode of the series, says Coulson will finally reveal the mysterious deal he made with Ghost Rider, which will impact everyone on the team. The timing may be even more intriguing than the reveal itself. . 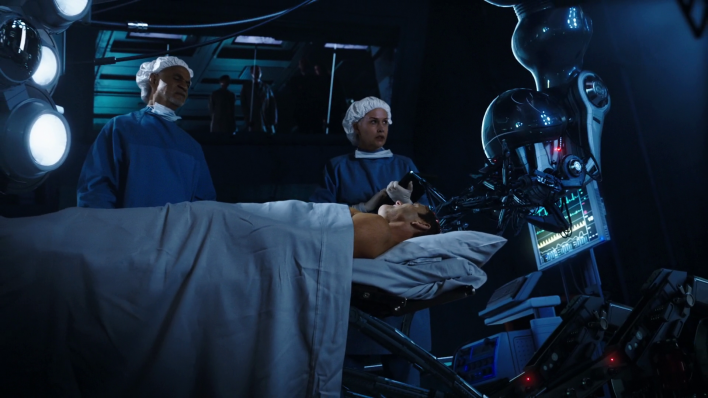 In the midseason finale episode, a future version of Yo-Yo told Agent May that SHIELD saving Coulson from dying causes Earth to be destroyed and human enslavement by the Kree. This future version of Yo-Yo trapped in Kassius’ custody confirms SHIELD is actually stuck in a time loop. The team knows of Earth’s dreadful fate yet doesn't know how to stop it. The future Yo-Yo also reveals letting Coulson die (he appears to be infected with Odium, the drug Kassius was injecting his allies with that turned their eyes black) is the only solution. Odium apparently takes away the user’s pain, leaving only their strength. It’s possible that whatever SHIELD uses to save Coulson sparks him to then inflict damage -- maybe it has something to do with Coulson’s Kree DNA? The true believers and Robin (whom May takes in after Charles Hinton’s death) claim a bright light appeared before the Earth was torn and crumpled. That light is believed to be aliens and of course, SHIELD went to fight them. The battle ended with the Kree overtaken by SHIELD, but the Earth still in pieces. “I wish they told us so I could answer that. I think there probably is some sort of connection. He’s connected to some sort parallel dimension that he goes to and we are definitely in a realm where parallel dimensions might come into play,” Gregg said. The last we hear of the deal is back in Season 4 when Ghost Rider tells Coulson to keep his deal with the devil a secret. He specifically says to not tell the rest of the team until the appropriate time. “I don’t envy you,” Ghost Rider says. “I was going to tell you the same,” Coulson replies. Perhaps traveling through dimensions allowed both to see a possible future where Earth was destroyed or even more, Coulson died. Perhaps he suspected the team would act differently if they knew their leader’s fate. Do you have any salient theories about what's going to be revealed in the 100th episode? Let us know in the comments. Agents of SHIELD returns to ABC March 3 at 9 p.m.